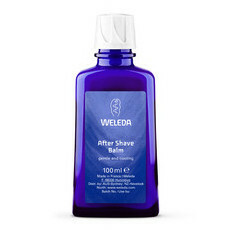 This Weleda Indulge & Regenerate Pack contains two beautiful Weleda products formulated with antioxidant-rich Pomegranate Seed Oil – Weleda Pomegranate Creamy Body Wash (200ml) and Weleda Pomegranate Regenerating Hand Cream (50ml) – and makes a luxurious gift for someone special. 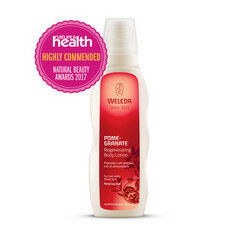 Formulated to cleanse, smooth and soften the skin as it protects against dryness, Weleda Pomegranate Creamy Body Wash also contains Macadamia Nut and Sesame Oils, and has the unique, inspiring scent of Sandalwood, Vanilla, Neroli and Blood Orange. Pomegranate Regenerating Hand Cream also contains Sesame Oil, organic Shea Butter and pure natural plant extracts, and is formulated to promote the natural renewal processes of the skin as it protects hands from ageing environmental influences. Made in Germany, NATRUE Certified Natural, GMO & Cruelty Free, Certified Fair Trade. Please refer to individual items. In the shower apply to wet skin using the hands or a loofah, and rinse off thoroughly. Great value pack, my mum has requested mote of the hand cream. I love these products, given to me by my niece for Christmas - the body wash is so creamy, and I like that it doesn't foam, but melts into your skin. Love the citrus fragrance, It is on my forever list.